As usual, I am late. Apparently this famous King’s cake or galette des rois is not usually served after January. It appears that I got in just in time, but for the rest of you it might not quite make the deadline. I assure you it is worth making anyway. When my good friend Camille came back from her French holiday, she told me about this special galette. “It is puff pastry filled with butter and sugar and almonds,” she said. I’m sure she could see my ears prick up. Camille then proclaimed it one of the best things to eat in France. In a country of patisseries on every street corner, that is very high praise. A galette des rois, or king’s cake is traditionally eaten on the twelfth day of Christmas, to commemorate the three wise men bringing gifts of gold, frankincense and myrrh. Deliciousness aside, half the fun is the tradition to include a small trinket or fève in the filling – the person who gets the fève gets to be king for a day. Although usually eaten on the 6th of January, kings cakes are available from mid-December until the end of January in France. Though after eating my first one, I dare say I’d be a proponent of them being an all-year-round type thing. Larousse Gastronomique notes that “During the Saturnalia the ‘king of the day’ was chosen by lot, using a bean concealed in a galette. It was only in the Middle Ages that this cake ceremony began to be associated with the festival of Epiphany.” Francophone countries had the Galette des Rois. Spain had the Rosca de Reyes, Portugal the Bolo Rei. What’s in a galette des rois? There is some confusion about whether the filling should be crème d’amande (almond cream) or frangipane, writes Clotilde Dusolier of Chocolate and Zucchini. 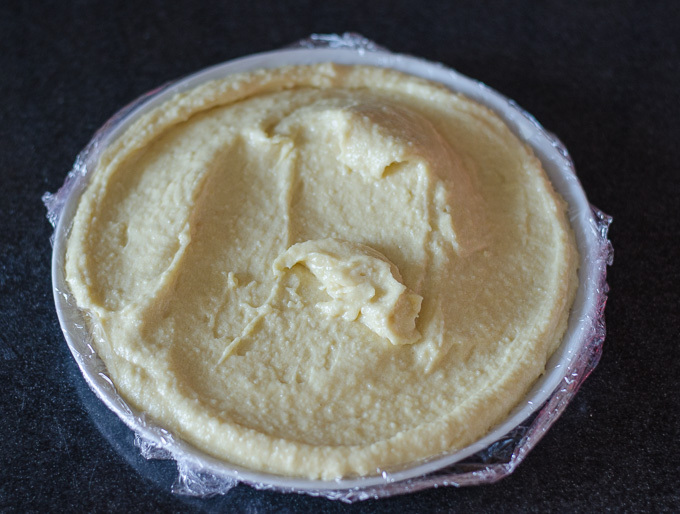 Crème d’amande is a mix of butter, sugar, ground almonds and eggs in roughly equal parts, whereas frangipane is a blend of roughly a third crème d’amande and two thirds crème pâtissière (pastry cream). Although both can be used to make a galette des rois, most commercial bakeries prefer to use frangipane as the decreased amount of almonds lowers their cost substantially. Home made versions almost always use creme d’amande as the filling. 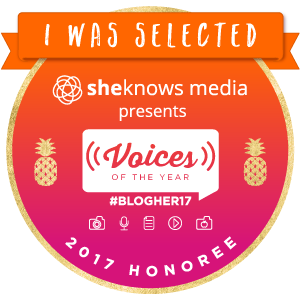 I used Amaretto instead of traditional rum or cognac – something I’m sure the French would frown about! I did it because I couldn’t find almond essence, but I have found that some people also find the flavour of almond essence overpowering, and the cheaper versions have a synthetic taste. Although David Lebovitz thinks that almond meal and almond flour can be used interchangeably, I remain unconvinced. This could be regional, but I dare say that almond flour is finer and could account for the fact that many people complained of butter leaking out of their tarts. He also recommends adding a touch of cornflour as insurance, or you can do as I did and up the almond meal content a tiny bit instead. If it’s very warm outside, you may even want to do both. And of course, unless you’re overly worried about people choking, don’t forget to include the fève! We were lucky enough to have the guidance of our French friend Noémi to explain the intricacies of proper galette tradition. The galette must be cut in a very specific number of slices: one slice for each person sitting at the table, plus one. The extra slice is symbolic for the first poor person one encounters on the street. Alas, if no one at the dinner table gets the fève, everyone can be comforted by the fact that the poor person was more deserving of being the king. In order to avoid allegations of cheating by the baker or the person serving the cake, the youngest person in the room is asked to sit under the table, thereby deciding who gets which slice. Noémi promptly declared that she had been practically living under the table for the past month, and so we passed the honour to the oldest person. The person who gets the fève is declared king for the day and is asked to select a queen. As with all things French, it is simple but tricky. Use good quality puff pastry or make your own (admittedly, I don’t even do that!). The trickiest part is making sure not to forget the fève (I did that), keeping everything chilled so that the puff pastry rises beautifully, sealing the pastry so the filling doesn’t leak out and last of all, scoring the design carefully so as to not pierce through the puff pastry. To make the almond filling, use a paddle beater to combine the butter, almond meal, sugar and salt until evenly mixed. Add the eggs one at a time, then add the amaretto and orange blossom water. On a lightly floured surface, roll each piece of puff pastry out into a circle – if using block puff pastry, divide into two before rolling each into a circle. Using a pot lid or baking tray as as a template, trim each piece into a neat circle roughly 5cm/2inches larger than the saucer in the above step – mine was about 28cm/11inches. Place each sheet of puff pastry on baking paper. Put one back in the fridge to chill, and leave the other (still on baking paper) on the counter. And, of course, don’t forget the fève! I used the Sinhala letter N. And of the six people at the dinner, the one person that won it was the only one whose name began with a T.
Brush water around the exposed perimeter of the dough, then place the other circle of dough on top. Smooth out the air bubbles from the centre and press down to seal the edges well. 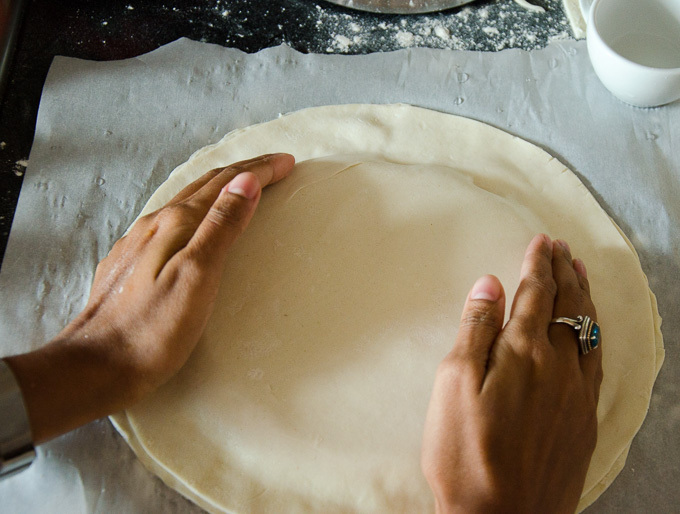 Place two fingers on the edge of the pastry and use a sharp knife to pull the dough down between the fingers (see picture). In a small bowl, beat the egg yolk and the milk, then brush evenly over the top of the galette. 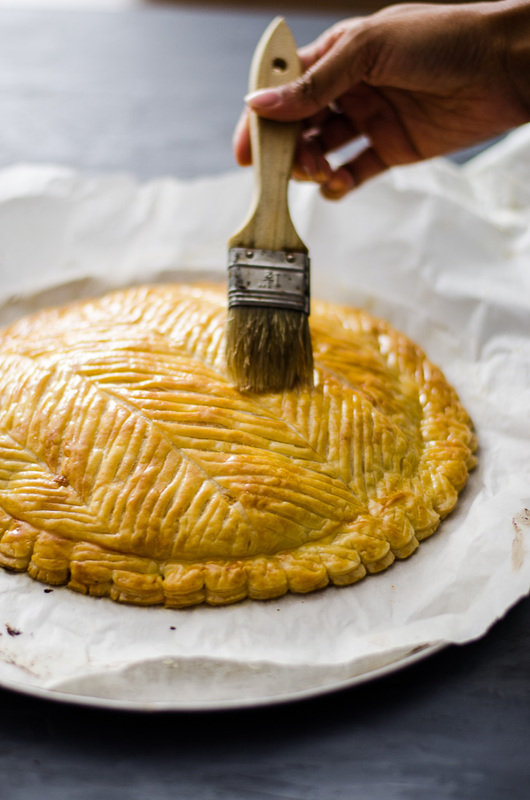 Don’t let the egg drip over the edges onto the baking paper as it will stick the puff pastry to the paper and make the galette rise unevenly. 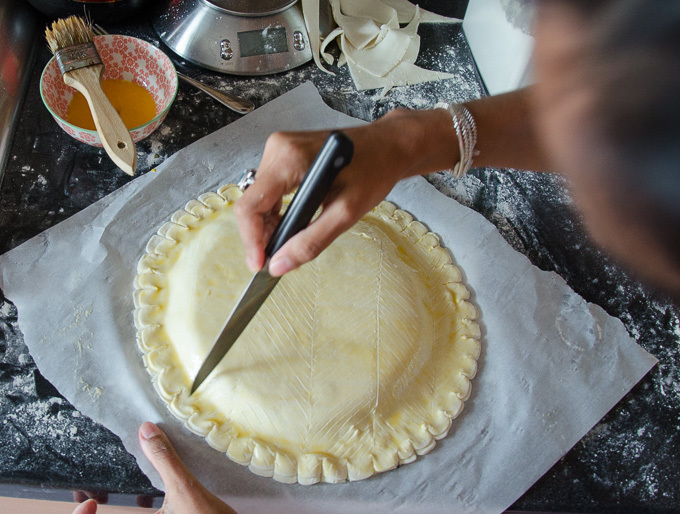 Use an office blade or sharp knife to score a pattern on the top, making sure to not cut through the top sheet of puff pastry. Poke 4-5 small holes (though the top layer this time) to allow the steam to escape from the filling. Chill the galette for 20-30 minutes (fridge or freezer is fine), while the oven is preheating. Bake for 30 minutes (35-40 if from the freezer) or until golden brown. In the last few minutes of baking, brush with the simple syrup glaze to give a shine and return to the oven for 2-3 minutes. 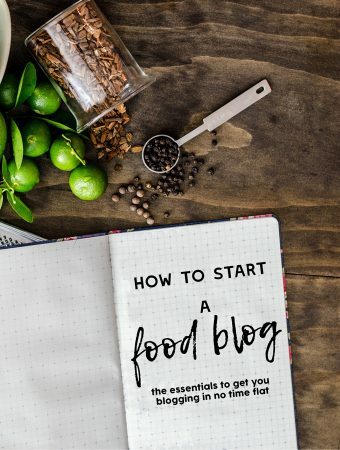 The printable recipe, without is pictures below. 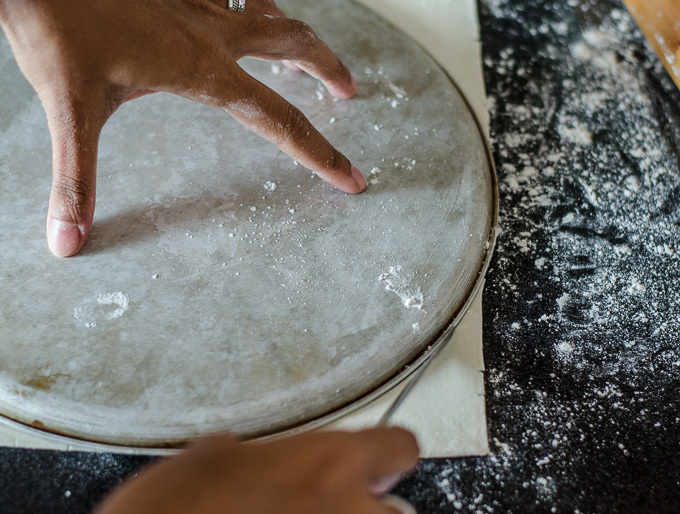 On a lightly floured surface, roll each piece of puff pastry out into a circle - if using block puff pastry, divide into two before rolling each into a circle. Using a pot lid or baking tray as as a template, trim each piece into a neat circle roughly 5cm/2inches larger than the saucer in the above step – mine was about 28cm/11inches. 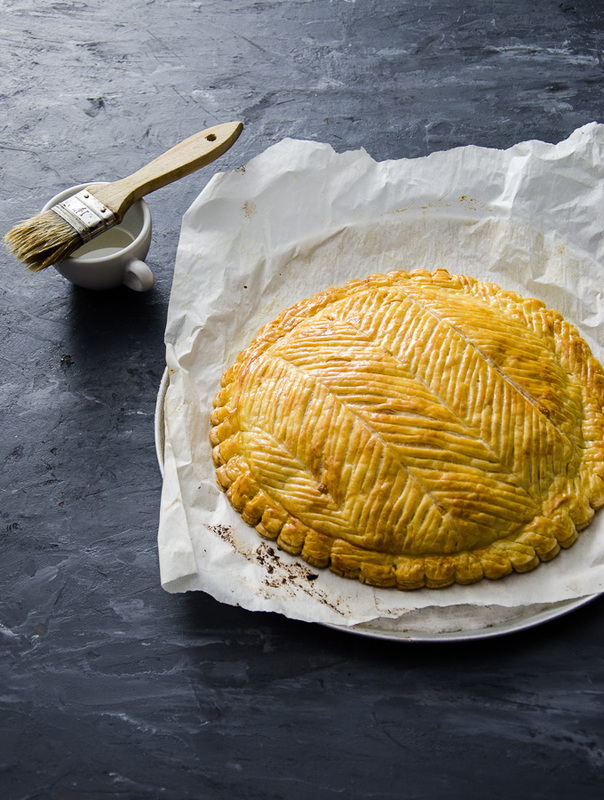 Remove the cling wrap from the almond filling and centre it on the circle of puff pastry, leaving a 1inch/2.5cm border around the edges. 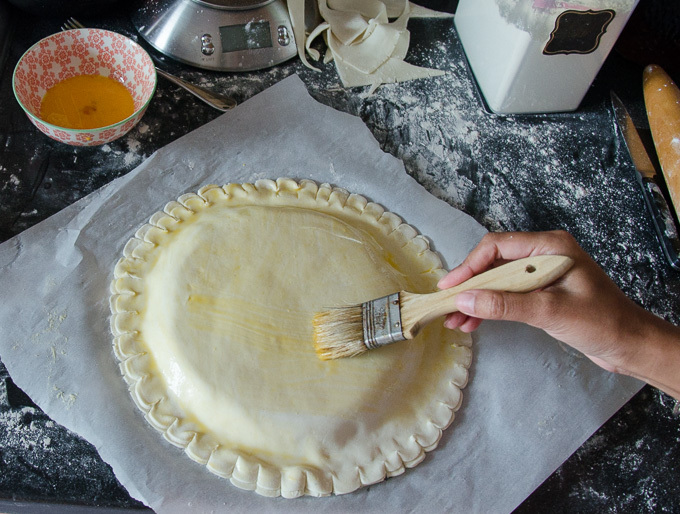 Make sure the baking paper is under the pastry – there’s nothing worse than doing all the complex assembly steps only to find the heat has made the bottom sheet of pastry stick to the counter!) Don’t forget the fève! 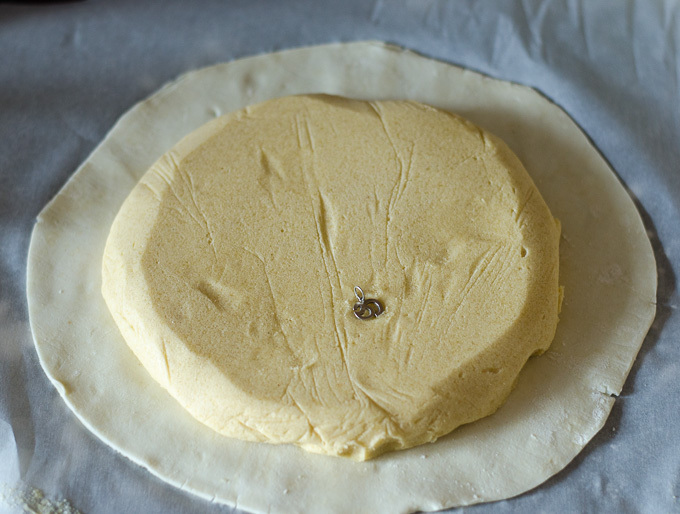 Brush water around the exposed perimeter of the dough, then place the other circle of dough on top. Smooth out the air bubbles from the centre and press down to seal the edges well. 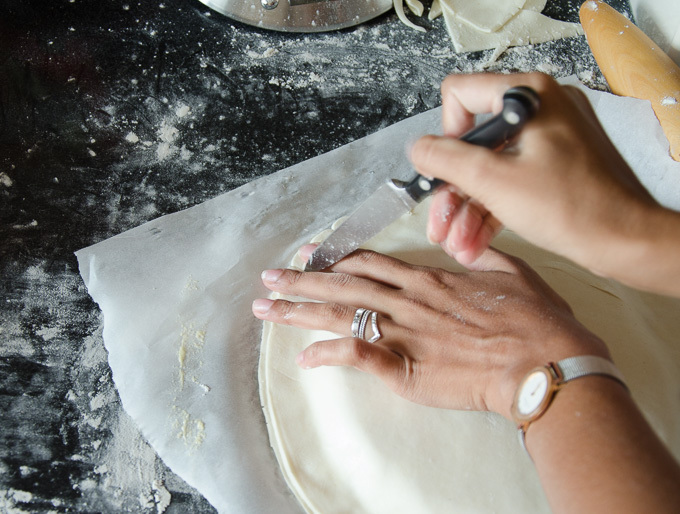 Place two fingers on the edge of the pastry and use a sharp knife to pull the dough down between the fingers (see picture). Chill the galette for 20-30 minutes (fridge or freezer is fine) while the oven is preheating. Bake for 30 minutes (35-40 if from the freezer) or until golden brown. In the last few minutes of baking, brush with the simple syrup glaze to give a shine and return to the oven for 2-3 minutes.The galette can be reheated in the oven before serving, if necessary.